We did a lot of walking in Seoul. One of the highlights during our walks was definitely the Cheonggyecheon stream. The stream was in the past polluted and covered with an elevated road, but since 2005 this stream has been cleaned up and made into an art and nature walkway through the heart of Seoul (TripAdvisor). Except Mr. D and I, Laura came with us on this walk. Laura Ashley the dress. Isn’t she a darling? Even if she don’t like me to tell you this, I will let you know that she is much less expensive than you might believe. The Swedish currency is currently pretty strong compared to the pound (she was purchased in Edinburgh) and it was 30% off (on everything in the store, very dangerous! ), so I got her to a very good price. Independent of the price, she is very precious to me and I am glad that she came with me to Seoul. We had a great time together! However, next time we go somewhere together I hope to pair her up with a pair of high heels instead. 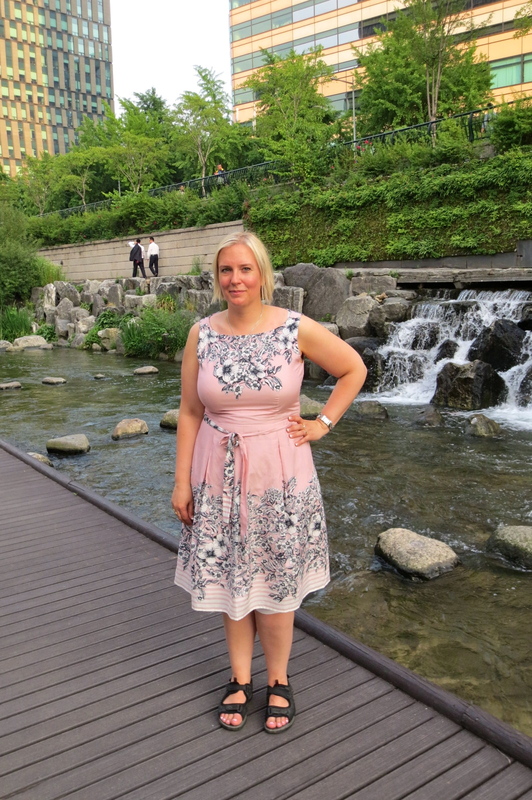 This entry was posted in Okategoriserade and tagged dress, Laura Ashley, pink, pink dress, seoul, style. Bookmark the permalink.